A few years ago, my mom and I were talking about a mutual frustration: we know our cupboards, refrigerators, and pantries are full of food but we lose track of what exactly we have and don’t use it all. I wondered if there would be an easy way to catalog our purchases like inventory — grocery stores use scanners, maybe we could too. That was it! Mind you, this was before the whole “there’s an app for that” for everything, so I thought maybe we could invent something that attached to your refrigerator with a barcode scanner to log what was going in and when it expired. 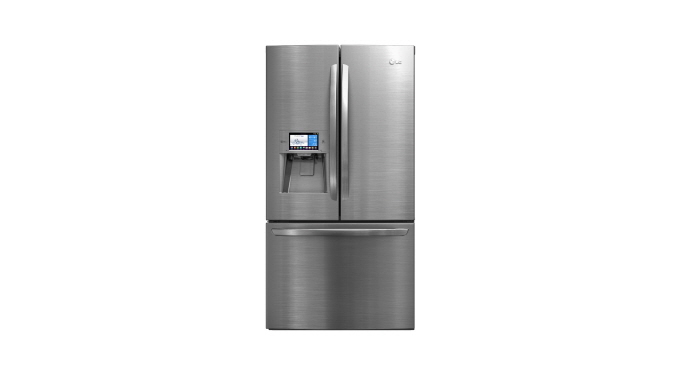 Or maybe, I thought, if the future gets all techy and awesome, maybe just maybe, it could even be built into the refrigerator! “No, no, no, let’s not get carried away,” I thought, that’ll make it too expensive. We want this baby in every household across America! Taking it even further, I envisioned that this machine would also be able to pull up recipes using ingredients I already have at home, helping me to use up what I’ve got (for instance, if I input “chicken,” “black beans,” and “sour cream,” the machine might give me a recipe for chicken tacos). I thought it would also be helpful in telling you what items you use regularly and how fast you go through them so that it could alert you when you’re running low on items you need, and also provide a handy shopping list. This thing was going to be awesome, I tell ya! LG’s flagship smart French-door refrigerator is equipped with a full range of Smart ThinQ™ technologies. Key among them is Smart Manager, which transforms the refrigerator into a complete food management system. Consumers can use the refrigerator’s LCD panel or their smartphones to check the food items stored inside, as well as their location and expiration date. Using the Smart Manager’s Freshness Tracker, users can also enter various food items, such as eggs, milk and vegetables, and check their suggested expiration dates. Additionally, the refrigerator recommends dishes that can be cooked using the ingredients available in the refrigerator. Blast! Someone should be writing me a check right now. I know, I know, they’ve probably had this bad boy in the works for a decade, but still. My idea. And not only does it do what I wanted, it connects to your smartphone so you can see what you need while you’re out shopping and don’t have to worry about forgetting your list at home or you can shop for home delivery groceries right on the screen. It also provides daily or weekly meal-planning recipes based on individual details like gender, weight, BMI, and age, as well as special dietary needs like diabetes or high blood pressure. It also has about twenty other features I never thought of, including adding technology that lets all of your appliances connect and talk to you so you don’t have to be downstairs to know that your laundry is done, and you don’t have to turn on your oven because when you pull up a recipe on your smart refrigerator, you can just send it to your oven and your oven knows the settings it needs already. It’s only a matter of time until we’re living like the Jetsons!